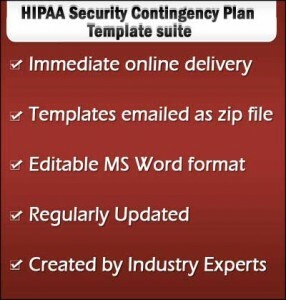 Our easy to use HIPAA Contingency Plan templates suite for Security rule can be used for Business Impact Analysis (BIA) with Disaster Recovery Planning (DRP) & Business Continuity Plan (BCP) by any organization. 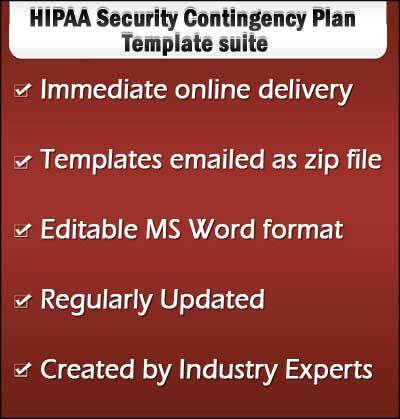 These templates help to comply with requirements of HIPAA, JCAHO, Sarbanes Oxley (SOX), FISMA and ISO 27002. Any organization, large or small, can use this template and adapt to their environment. Allow us to jump start your Contingency planning project with the most comprehensive templates. Please contact us for more information at sales@supremusgroup.com or call (515) 865-4591. To view specific section of this document, please contact us at Bob@supremusgroup.com or call us at (515) 865-4591.